This New Year's Day, in spite of all the crap going on in my personal life, I decided to go to The Sewing Studio in Maitland as I had planned all year. Sometimes you just have to do something fun for yourself that you've been looking forward to, you know? I went with just my mom this time, and while it was a bit difficult to really focus due to everything else going on in my mind, I still managed to find some great deals and now I am all prepped for some really great projects this year :) So, what did I come away with? Get ready for some #fabricporn lol. First off I'll show you the knits. These were all in the bargain annex of the store, which means they were already marked 50% off, then you got an additional 40% off on top of that - total score! The fuchsia is a nice thin jersey - it happens to be the exact same color as my Classy Parisian top, but it was a nice fabric for a great price - 2 yards for $6.00. Maybe it will become my signature color, lol. The blue is a sort of hounds-tooth pattern that has blue and teal with the black and there's a little glitter in there too. This one is a sweater knit and thicker than I've tried before, but I thought it could be fun to try out. This one was 2.4 yards for $7.50. 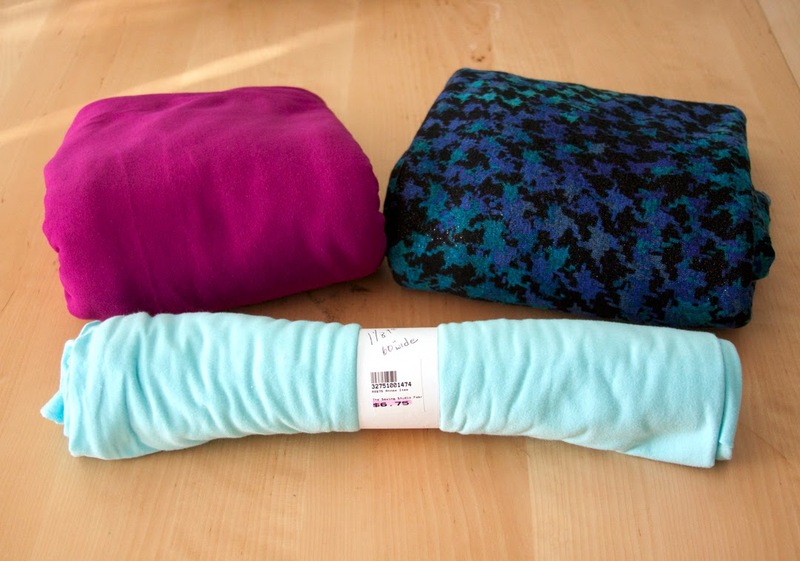 The light blue is another thin jersey like the fuchsia, but it was a remnant piece. This one was 1.15 yards for $4.00. I admit I had hoped to find more fun knits for t-shirts since I've enjoyed making them so much, but I';ll just have to survive off these and my stash until the next sale I can attend. This next shot is of the potential linings and slippery stuff. 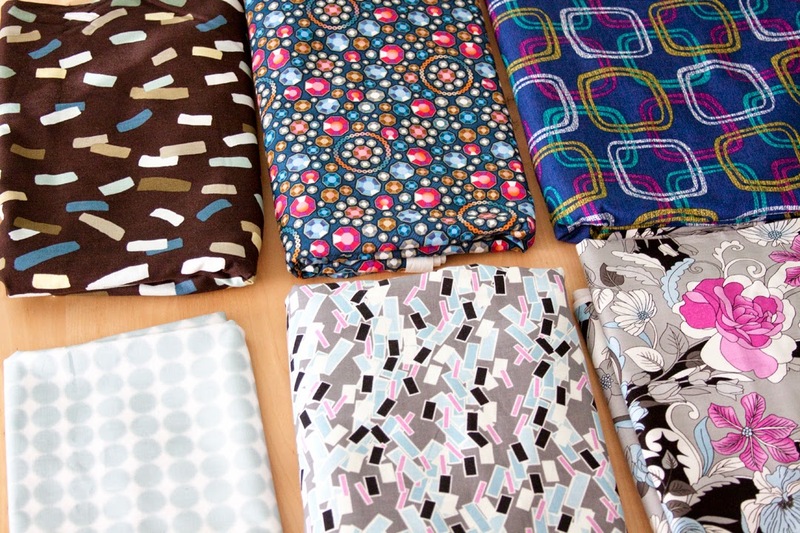 All of these are most definitely polyester, but they are slick enough to use as fun linings if I so choose. I make no promises though - they may end up as something on their own - we'll see :) The black and white is a matte fabric that might be a poly crepe - it's nice and drapey, and I think it's slippery enough for a lining as long as I'm not wearing tights (which I have not been known to do) This was 2.5 yards for $7.50. 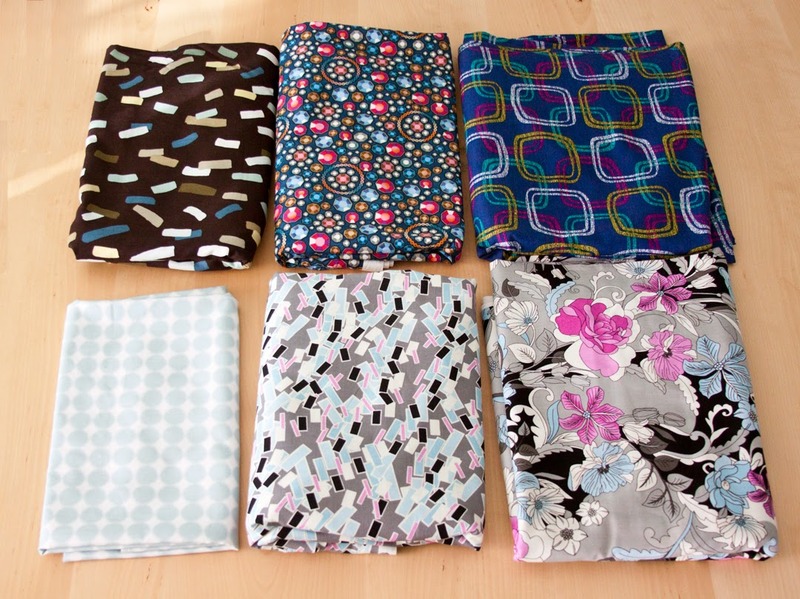 The black/white/teal splotchy one is a shiny poly and it was 1 yard for $3.00. 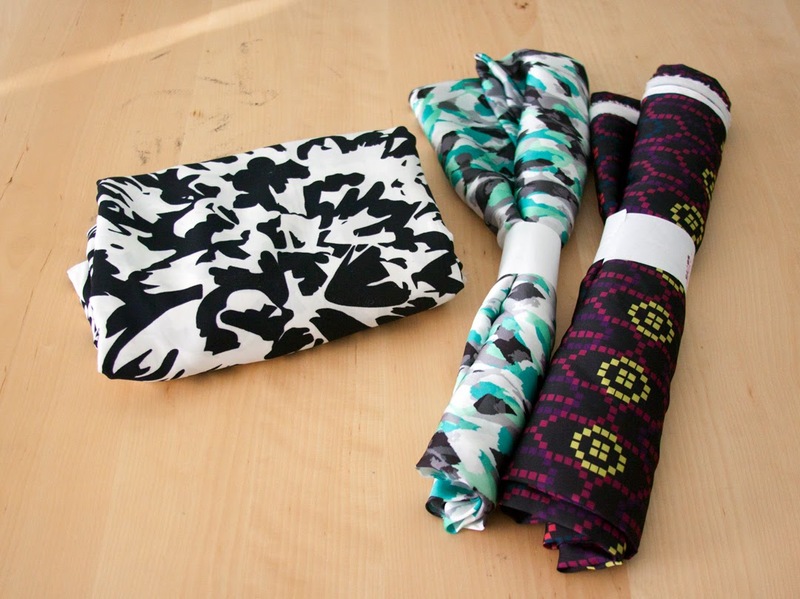 The black with multi-colored honeycomb print is more matte and this one is 1.75 yards for $5.25. From the notions wall, I was a little more sparing this time - I have so many that I really don't need many more. 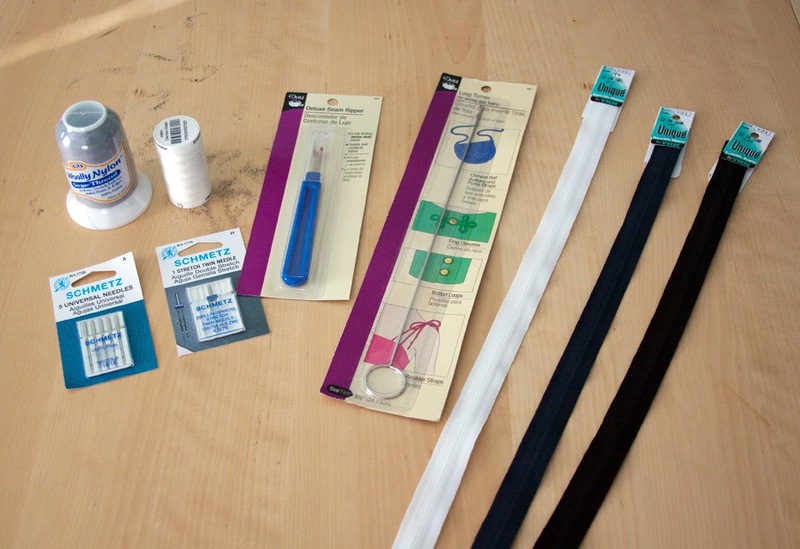 I just grabbed a new turning tool and seam ripper, along with some universal needles, a jersey double pointed needle (I'd been using a universal one before), some wooly nylon thread for knit hems (they only had gray and colors, so I grabbed gray), some Mettler white thread, and 3 zippers for some of the other fabrics I bought. 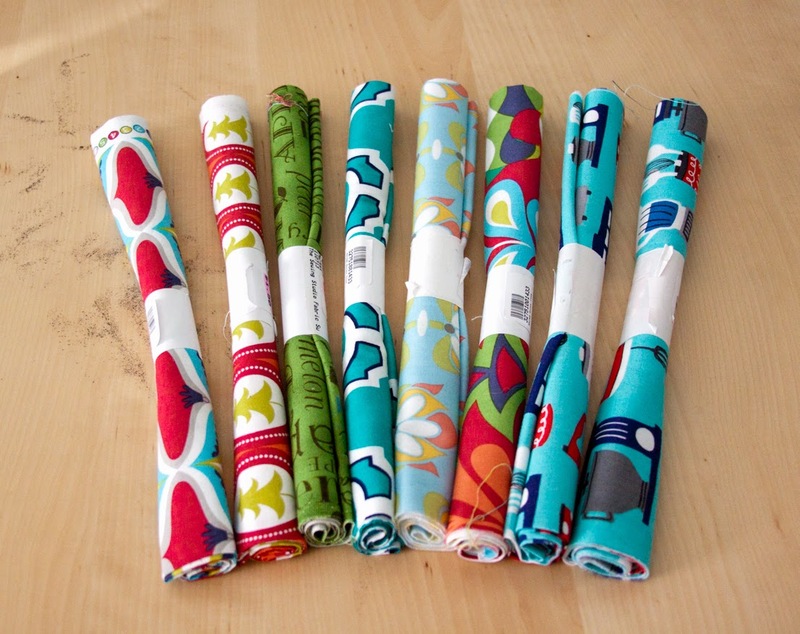 I always grab a few cute fat quarters from the sale section if I see them. This time I came away with 8 - two of them are the same fabric. All of these were $0.90 each! I'm really glad I thought to look at the ribbon wall this time since I usually skip over it. I'd hoped to get real rayon petersham or grosgrain for my hand knit sweaters, but they didn''t have any :( Looks like I'll have to break down and order it online. 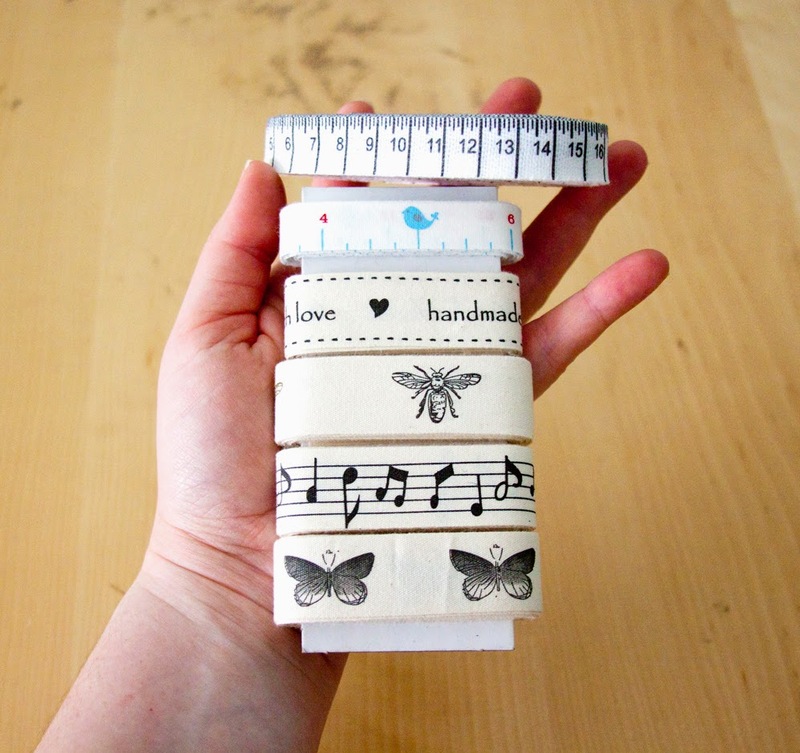 I did find all these cute cotton tapes though. I'm not sure if they will work to stabilize button bands, but if not I will use them as waist stays and fun hem details :) The only one I remember the brand is the thing one with the bird - it's Riley Blake and it was the most expensive. The others wrapped on the card are all from the same brand (I can't remember it now, but it started with an M) - they are natural colors and one has butterflies, one has music nots, one has flies, and one says "handmade with love". I got 3 yards of all except the handmade ones since there was only 2 on the roll. The measuring tape is thickest and cheapest and I got 6 yards. I didn't pay more than $3.24 for anything shown here. So, I came away with quite a few project plans and supplies to make them :) I'm excited to have time to make some of these up - I'm not going to beat myself up about deadlines though. Sewing is meant to be a fun thing for me, so I will just take it as it comes!